My favourite homemade cloud dough recipe is made with just two ingredients. 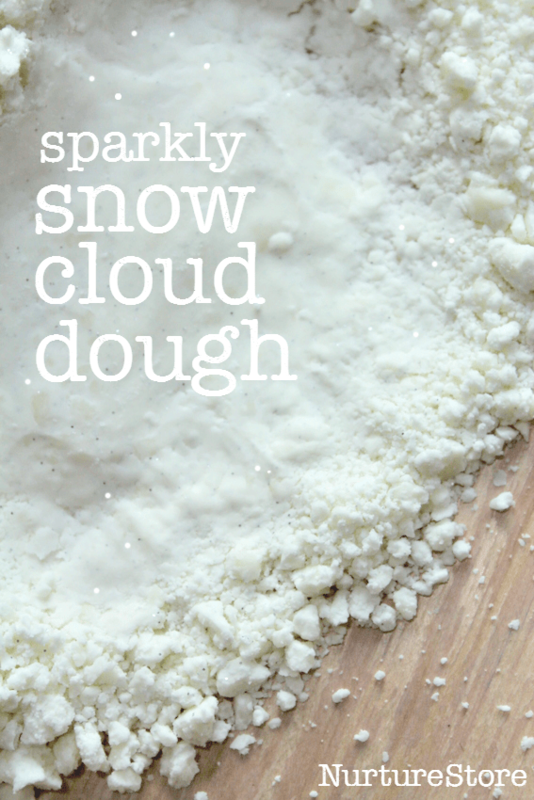 glitter is optional, but we like some extra sparkle for our snow dough! Plain / all purpose flour is great, but I use corn flour / corn starch for this snow cloud dough, to get a whiter colour. * Be warned though that corn flour / corn starch can be a little temperamental, and you might need to stir in more oil than with plain flour – perhaps an extra cup? – to get the desired consistency. I used baby oil for this recipe, to get a nice fragrance, but if you need a taste-safe recipe for young children you might prefer to use a vegetable oil. 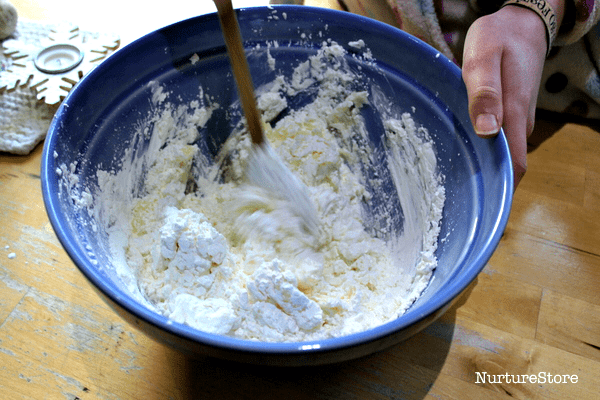 Simply combine the ingredients in a bowl and get the children to help you stir, stir, stir until you create a crumbly-textured dough. 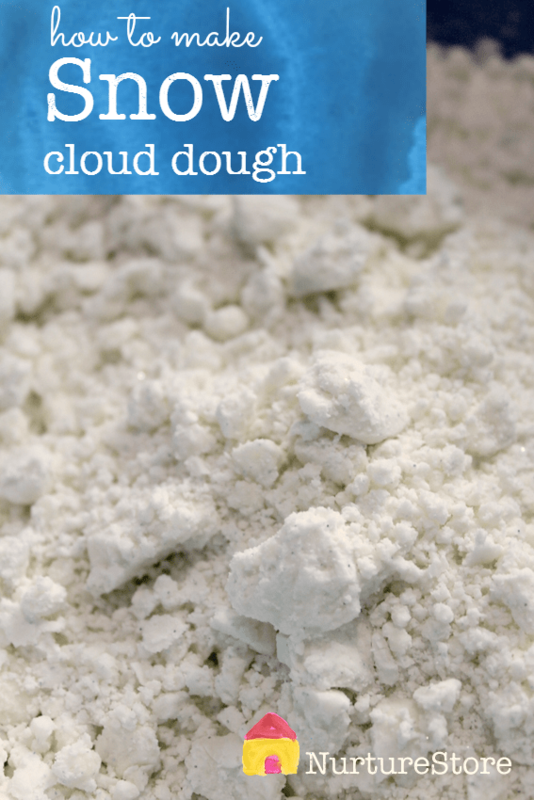 Cloud dough is different to a traditional play dough recipe. It’s lighter, more crumbly, softer and a great sensory experience. It’s a wonderful work out for fine motor skills and hand strength. You can squeeze it together in your fist and it will hold its shape. And then you can use your finger tips to make it all crumbly again. You can also smooth it out to get a really soft, flat surface. 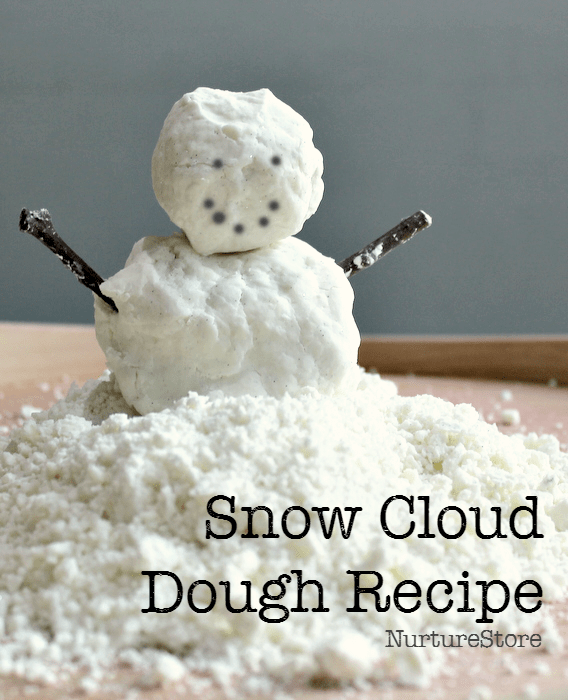 This easy cloud dough recipe is great for making a snowy landscape for pretend play. You could add in some twigs and make snowmen. 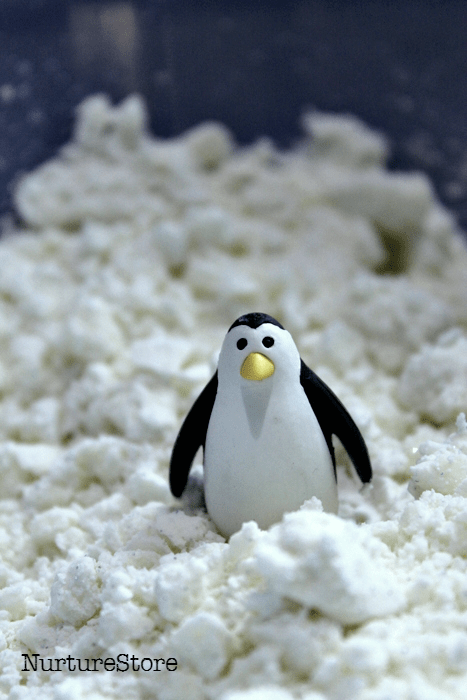 Cloud dough is different to traditional play dough and a bit more of a challenge to mould into shapes, so stick with a snow play dough recipe if you think your children might get frustrated or find this too tricky. My 8-year-old loved this, the toddler got cross! 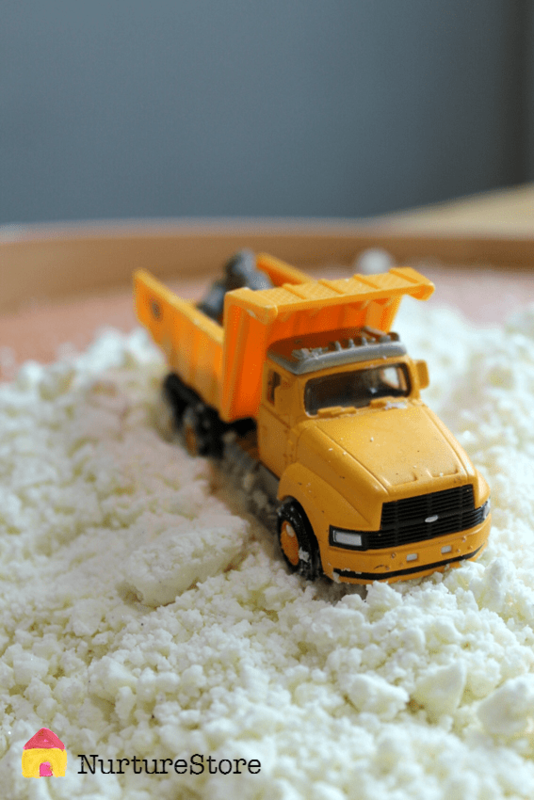 And this snow cloud dough is really good for creating wintry pretend play scenes. Add in some vehicles for a snowy adventure! This dough is messy! It’s also wonderfully sensory. So, don’t be put off by the fear of a little clean-up. Set up your invitation to play somewhere it will be easy to sweep up any spills. We play in our hard-floored kitchen, never on a carpet. Then relax, let the children play, and have them help sweep up with a dustpan and brush when they’ve finished. I store our cloud dough in an air-tight container – usually a mason jar – in between play times, and find it lasts for months. These ideas are great. So simple yet so creative. Can’t thankyou enough. Thank you Maria! Simple and creative is what I aim for! Thanks for this! I do have a question. Howlong will this last? If I’m in a classroom with limited materials and wonder how long it can sit in our sensory bin. Will chilling it overnight help it stay fresh? Hi Amanda. I think that would be fine, if you cover over the top with a lid or some kind of wrapping. I store ours in a glass jar with an lid and it lasts for months.